Border Block is a logic puzzle. A rectangular or square grid contains numbers in some cells. 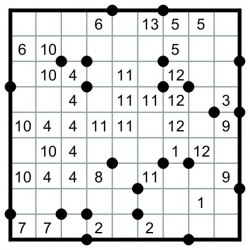 It is necessary to divide the grid into regions. Cells with the same number belong to the same region. All points where three or four lines meet are given.